On Saturday, June 17th, meet your neighbors for bagels and coffee and, after a day filled with activities, wrap it up with dancing to the music of Dave Brown and the Versatiles at a free concert in Good Shepherd Plaza. 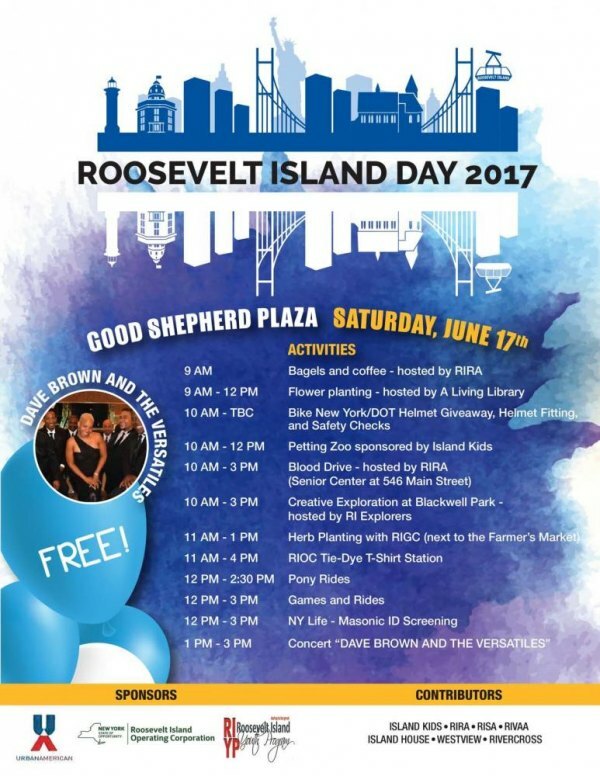 Guided by the Roosevelt Island Operating Corp., Roosevelt Island Day is co-sponsored by Urban American and the Roosevelt Island Youth Program. But there are plenty of other contributors. You can start your day with the Residents Association. They start giving out free, get acquainted bagels and coffee at 9:00. Kicking activities off at the same time, join A Living Library for flower planting. A highlight every year is a petting zoo set up by Island Kids. Children get a chance to get to know animals to which they normally have little access close up. The zoo opens at 10:00. Also for kids, games and pony rides get going at noon. But before that, at 11:00, the RI Garden Club oversees herb planting farther down Main Street near the Farmer's Market, and RIOC rolls out its Tie-Dye T-Shirt Station. For grownups, RIRA manages an all day Blood Drive across the street at the Senior Center, your chance to contribute to an established, annual success while saving enough energy for Dave Brown and the Versatiles in a lively concert of dance music inspired by artists from Michael Jackson to Lady Gaga. Go ahead and try to stay in your seats. Nearby, until 4:00, artists from Gallery RIVAA offer free drawing classes and portraits for anyone who chances to stop by, and from 10:00 until 3:00, the Roosevelt Island explorers lead creative expeditions through Blackwell Park. There's more. So, set aside a few hours to share the pleasures of Roosevelt Island with the rest of the community. Have some fun while you're at it.